Will young people get the education they need? Or will they be left behind? Within every challenge lies an opportunity waiting to be seized. Businesses know this. Today, the world faces an urgent demographic challenge: 1.8 billion young people, between the ages of 10 and 24, are standing at the door of adulthood. Every month, 10 million young people reach working age – ready to begin productive lives. Will they get the education they need? Will they gain the skills and training they need? Or will they be left behind? These young people also present an incredible opportunity for the world. And for your businesses. They’re not only your future employees and customers. They’re tomorrow’s dreamers, doers and thinkers – tomorrow’s leaders. Imagine what they could create: new medical cures, new modes of transport, new ways to communicate, more sustainable economies, even a more peaceful world. Their lifetimes could be full of breakthroughs, inventions and progress that could benefit entire economies. They hold the future in their hands. But this “youth dividend” is by no means assured. Because today’s world of work is changing faster and faster. Globalization and technology are rewriting the rules of the global economy – and rapidly revising the skills required for employment. The quantity, quality and usefulness of education and skills-training is more important than ever. Meanwhile, countries are struggling to prepare young people for the workplace. 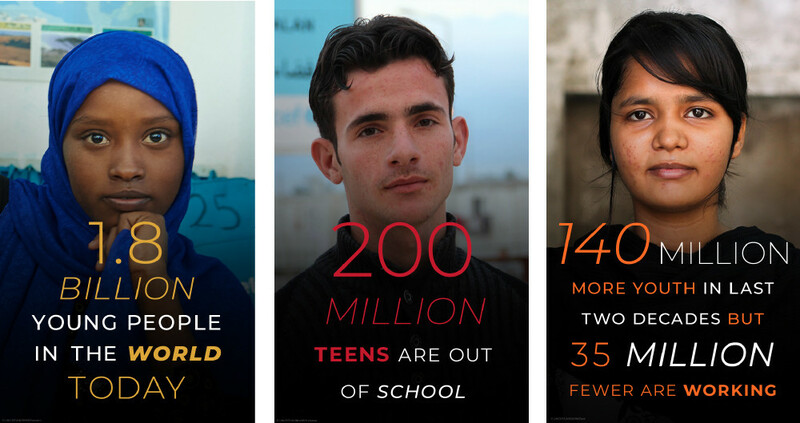 Two hundred million adolescents are out of school worldwide. Globally, six in ten children and adolescents do not achieve minimum proficiency in reading and maths. Those that do gain an education face an uncertain job market. For example, Africa’s working age population is expected to grow by an additional 450 million people by 2035. At the current pace, only 100 million new jobs will be created: not even a quarter of what is required. Young people themselves are sounding the alarm. They’re telling us that the education and training they receive aren’t preparing them for the available jobs. They want – and need – future skills for future work. And they’re worried that no jobs will be available. As a global community, business as usual isn’t good enough. We need a totally new and different way to solve these problems. Guided by the urgent demographic challenge, and what young people are telling us, UNICEF is gathering partners around a bold new initiative: Generation Unlimited. We’re taking a page from the venture capital investment model to create a new platform to match the best social initiatives for young people with the ideas, resources, reach and vision of a number of partners. 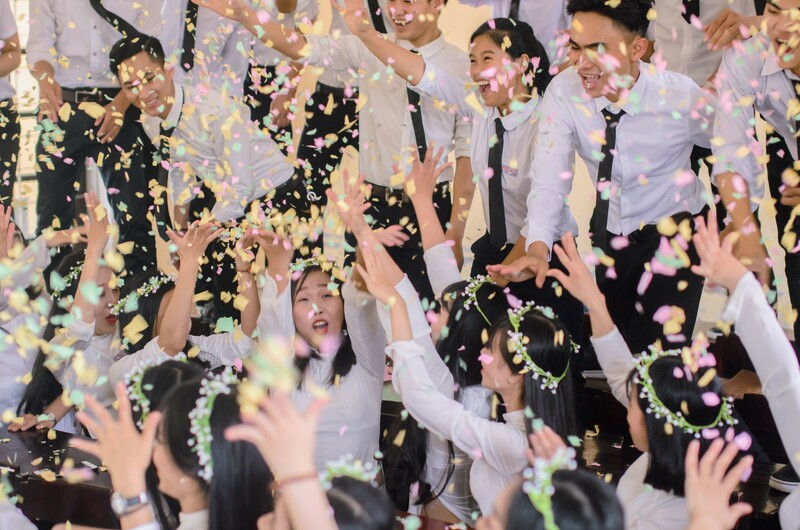 Vietnamese pupils celebrate finishing high school. The goal is ambitious: to get every young person into school, learning, training or age-appropriate employment by 2030. And we’re working with governments, businesses, innovators and young people themselves to identify, design and scale up specific, proven solutions that can meet their needs. We need businesses to join us. We need your ideas, expertise and ingenuity as we solve the greatest challenge in the world today. Here are seven ways that businesses can support young people’s futures. We need your expertise, innovations and market reach as we develop new solutions to link young people with quality secondary education, skills and training. Do you have any products or innovations that could be modified or scaled up to better connect young people to quality education or new skills? Let us know. Every business wants to connect with young people – the group that will ultimately decide and lead global brand affiliation and loyalty for decades to come. With unlimited online access to news and current events, young people are more socially conscious – and more socially engaged – than ever before. Businesses that find innovative new ways to tap into this demographic and their spirit of global citizenship will have a distinct advantage over those that ignore this opportunity. Businesses don’t need to profit at the expense of communities; they can profit because the communities in which they operate, and the people who live there, are well-supported by the local business community. This includes young people. By investing in local solutions that help youth access not just education but skills-development programmes, businesses can create shared value that benefits businesses and communities alike. Seek out new opportunities in your operations to train young people in your communities – particularly disadvantaged youth – through hands-on mentorships and apprenticeships, for example. An excellent opportunity to prepare tomorrow’s workforce while also identifying and nurturing potential young talent for your own businesses down the road. It’s a cliché, but it’s also true: young people are your future. Value them as such. Bring them into decisions and let them shadow veteran employees. Above all, recognize their unique expertise – you will need it one day. Ensure that your policies and practices support women and mothers in your workplace, and that young women have a voice in the decision-making process at every level. Today’s generation of young people – customers and employees alike – put a high priority on gender and identity issues. Businesses that recognize and prioritize this issue will have a distinct advantage over those that don’t. Take every opportunity to assess the “human” impact of business operations on young people, and put in place safeguards to protect their rights according to international standards of conduct. By reducing risks for the children in the communities in which you operate, you not only enhance your own corporate reputation – you make the world a better, fairer place. Businesses have always been a part of UNICEF’s story – from the development of vaccines that save children’s lives to the protective equipment that keeps our health workers safe from disease, from new rapid diagnostic tools to the food industry’s development of ready-to-use therapeutic food. We need your help, your ideas and your vision once again. With 1.8 billion young people on the verge of entering the workforce, supporting their needs is the calling of our time. A call that must be answered with a new global movement that involves the full support of businesses. Please join us as we translate this urgent crisis into new opportunities for businesses, economies, countries and – above all – young people.